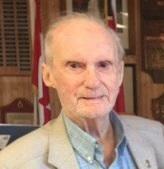 Angus Archibald Ferguson of Sydney passed peacefully in the early morning of August 8, 2018 at the age of 87. He was born in Florence on December 9, 1930. Over his lifetime, Dad went by many names; Ferg, Angus, Archie, Fergie, Auggie and hey you, want a drink? He commenced his employment with the Air Force and continued to have a rewarding career with the federal government. He is survived by his daughter, Janet Ferguson and two grandsons, Steve and Ryan Zbitnew all of Ottawa. Others mourning his loss are: his dear friend, Vera Pendergast and all of her family of Whitney Pier, and his sister, Norma Ferguson of Halifax. He will be remembered for his witty sense of humour, teaching me to put ice cubes in my tea (to cool it down faster), and volunteer work he performed in his community, particularly with the Sydney Association for Community Living. He was a proud member of Branch 12 Legion. A special thank you to Janie Dixon for the care she provided to Dad over the past six months. Dr. Fraser, Dr. Abboud and all the staff of 4E in the Cape Breton Regional Hospital who gave an amazing end of life care for Dad and his family and friends. Dad did not wish to have a funeral or service. Please celebrate his life with a drink, be it alcohol, or tea with ice cubes! Dad would say: Take it easy, but take it. Messages and memorials may be directed to the family at www.chantfuneralhome.ca. Funeral arrangements are under the care of S.W. Chant and Son Funeral Home, 564 Alexandra St. Sydney, NS.